Born: April 15, 1819 in Sandwich Ma. Died: January 30, 1883 at 63 yrs, 9 mos. Married: August 27, 1839 in Sandwich Ma. To: William Allen Barlow, Capt., Dea. ; (1817 – 1904) (Jesse Barlow, Capt. & Polly Godfrey); William married (2) Harriet Dexter (1817 – 1901) (Ephraim Dexter & Rachel Snow) in Bourne Ma. on April 27, 1884; Harriet married (1) Daniel Herbert Kendrick (Abt.1816 – 1879) in Falmouth Ma. on July 9, 1839. 1. Esther Ann Barlow Thompson; (June 26, 1840 – October 8, 1914); Married George Carpenter Thompson (1835 – 1915) (David Thompson, Jr. & Hannah Carpenter) in Sandwich Ma. on June 15, 1865; George married (1) Emily J. Round (1840 – 1863) (George Round & Martha Allen Luther) in Rehoboth Ma. on July 3, 1861; They lived in Pittsfield Ma. & they died there; They are buried in Church on The Hill Cemetery in Lenox Ma. ; They had a son, Georgie A. Thompson, who is buried in Pocasset Cemetery. 2. Leonella/Nellie Barlow Perry, twin; (February 23, 1845 – November 5, 1872); Married Elisha Blish Perry (1842 – 1870) (Salathiel Henry Perry & Rebecca Freeman (Hall)) in Sandwich Ma. on December 9, 1866; Elisha, a mariner, was lost at sea; Leonella/Nellie & Elisha are buried in Pocasset Cemetery. 3. 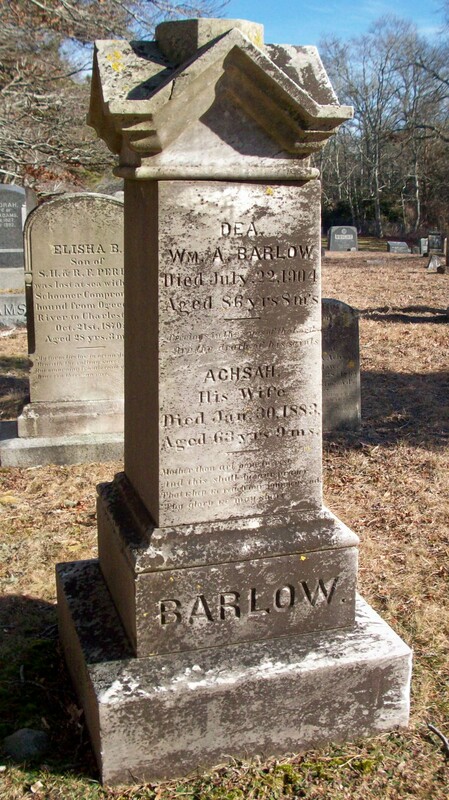 Gulielma Barlow, twin; (February 23, 1845 – July 13, 1845); Gulielma died in Sandwich Ma. at 4 mos, 19 d..
4. Mary A. Barlow Thompson; (September 14, 1848 – September 1, 1897); Married Marcus Morton Thompson (1840 – 1900) (Lewis Thompson & Huldah Wood) in Middleboro Ma. on October 28, 1883; Marcus married (1) Susan M. Nichols (James Gilbert Nichols & Lucia M. Cole) in Halifax Ma. on January 9, 1869 & married (3) Rachel Snow Kendrick Beckerman (1843 – 1927) (Daniel Herbert Kendrick & Harriet Dexter) in Pocasset Ma. on March 2, 1899; Rachel married (1) John A. Beckerman, Capt. (1819 – 1887) (John Beckerman & Margaret (–)) in Sandwich Ma. on December 25, 1861; John married (1) Ann Phillips Kendrick (1829 – 1859) (Solomon Kendrick & Anna (Phillips) Weeks) on Abt.1849; Mary, Marcus & Susan are buried in Cemetery at The Green in Middleboro Ma. ; Rachel is buried in Pocasset Cemetery & John & Ann are buried in Cataumet Cemetery. 5. Achsah E. Barlow Stevens; (March 21, 1851 – May 6, 1919); Married Edwin Franklin Howard Stevens (1841 – 1931) (Ezra C. Stevens & Lydia C. H. Magoon) in Sandwich Ma. on February 20, 1876; They lived in Middleboro Ma..
6. William Allen Barlow, Jr.; (June 14, 1853 – August 14, 1883); Married Delia Adelaide Adams (1858 – 1899) (Fitz Adams & Keziah Ross); William was a Jeweler & died at 30 yrs. ; He is buried in Pocasset Cemetery. 7. Nathan F. Barlow; (September 23, 1859 – December 28, 1865); Nathan died at 6 yrs, 3 mos, 5 d. & is buried in Pocasset Cemetery.